nothing say fun like like a hot pink tutu and some hi-top Vans! I LOVE VANS....I've LOVED working on VANS photo shoots....they are VAN-TASTIC! I loved going to the VANS headquarters with Ian...and them, letting me dig through their sample shoe closet...and saying I can take them home!IT was like winning the stylie-shoe lottery! checkered bags of shoes....zebra pattern laptop bag...paint splattered leggins...it's print-tastic! Forget the giant boom box...please, for the love of ZEBRA print...look at these shoes....they are no longer in my closet...and man do I wish they were! I wish I had a picture of my very first pair of vans! I think they were the white canvas ones with a blue stripe on the rubber! Do you remember your first pair of Vans? What kind were they? You look so tall Kandee! =) I also love vans, they are my favorite! My first pair looked like the skater shoes.. hot pink and black!! Loved those things!!! My first pair were black w/ white rubber. I replace the shoe laces with hot pink shoe laces that had white stars on them. (I heart stars!) I still have the shoe laces. Have you ever seen the Kim Saigh inspired vans? She's a tattoo artist that designed a line of vans. I love vans!!!!! my first pair was white and beige checkered ones!!! I still have them, even though they have holes all over :) They were my favorite pair, and I had to beg my mom to get them for me because she said they were too expensive for soooooo long!!!!! Oh gosh, I LOVE the all red ones. My first pair were pink & black checkered slip ons! :) I wore them until they had holes. I loved those shoes. Now I'm rocking a pair of black prison issues! (the ones with the velcro, so clever how they thought of the name. ;)) I love Vans! I'm due for some new ones! vans used to be my hubby shoe sponsor for 3 years. Every shoe in every color sent to our front door constantly. It was like christmas! My very first pair of vans was in fifth grade, they were the black 3 hole lace up. That was when yaga, stussy and mossimo were popular. (Shows how old I am I'm now 28)haha Now I have some pink slip on one's with black bandana print with skulls. I want some high top ones! Super cute! My first pair of vans were these super sweet holographic ones back in like 1998. I still have them around here somewhere. Kandee, can you put together a portfolio of commercial shoots you've done? I'd love to see some of your professional work! I love vans!!! Im so glad to hear u do too :) My first pair was the black and gray chekered ones. I don't remember my first, but I remember my favorite: Blue velvet with all black rubber and black laces. So early 90's, so junior high. I miss those shoes! Your Vans rock. 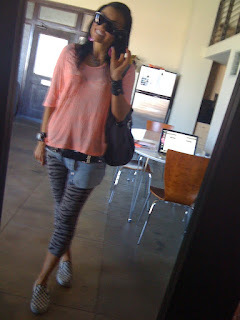 I love your choices and the black and grey zebra printed leggings. My first pair.. I guess that were black ones, with those 'vans dogs'. It's kind of funny to say that I've bought new vans today! Two colored authentic ones. Black on the front, grey in the back. Love 'em already! Oh my goodness, I would've passed out with happiness if I got free Vans! You lucky thing! I'm obsessed with Vans. It's seriously all I wear. Those or my awesomely worn in Converse. My first pair was checkered brown and pink. I still have 'em and love 'em to death, even though the color is so faded that it doesn't even look pink anymore, haha. But my checkered black and white are probably my favorite since they go with everything. Okay, maybe not, but I MAKE them go with everything. Hahah. Thanks for the photos galore! Now I wanna go buy more. Ahhhh, need my paycheck right now! Love your TuTu.. and your zebra shoes r hot!! also i would love if you would subcribe to my blog :) my first time blogging .. Awe loooove the zebra shoes!!!! i want a pair! i love vans, i had to get my baby a pair of vans crib shoes! My first pair of vans was from when I was in 2nd grade I think . . . They were pink and purple checkered canvas with red hearts in the purple chechers. My now pair is white/black/grey plaid canvas. Love how you can pull off any look and make it Kendee-style! I'm sure you already knew this but...they make baby vans. I think cupcake needs a pair! ur bloggys and videos are awesome!! Now, I just have my classic, black and white checkered slip on Vans that are perfectly broken-in and SUPER comfortable. Vans will never go out of style. 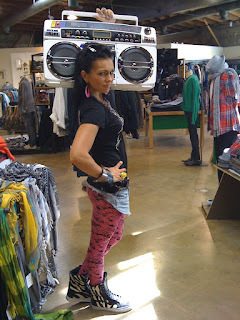 you are even cooler than Vans, Kandee !! OMG! I would have died and gone to shoe heaven! I love vans I have been wearing them since I was a toddler. I have two pair of black slip on and one brown and white pair I love them so much. I love your all red slip on pair where did you get them? I miss my Vans! I had a pair of the classic, black and white checkered ones. They got dirty and worn-out way too quickly. Do you still dress like that? im picky the last time i actually waited months for a trip to florida to buy VANS there haha and i found a pair i looooved..
they are the best.. much love! So that's why Janice Dickinson's face is melting off... Unsanitary cosmetic practices. My first pair were in 96 they were white and hologram. My. 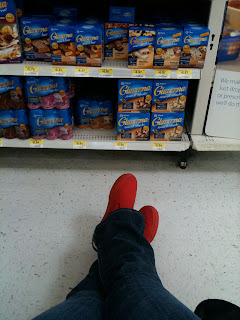 Favorite shoes in that era were my red candies though. I love your red Van's! You should try some Red TOM'S I LOVE THEM! So fun and for such a good cause!! my first vans were blue and yellow argyle print! goodness, I'm dying to get my toes in a black and white checked pair! I'm grateful you blog everyday Kandee. Kandee....I am soooo jealous. You have no idea! I have been a fan of fans since the early 80's! 1982 and I was rockin' black and white checkered slip-ons, a Stray Cats tee and hot pink shades and riding around the neighborhood on my bike. I never had a pair of vans. We are only a 1 car family. But a few years ago, we had 2 cars. Though not vans though. One was a Stratus and the other a Durango. Were yours Fords? Or Nissan's? My first pair of vans were the white ones with a multicolored/changing V on the side lol I was in 6th grade and thought I was the coolest kid EVER! I haven't had vans in soo long but this post really made me want some again! They are great to just throw on! Vans were/are awesome! My first pair were custom made at the Vans store....white with black and pink skulls, pink inside the shoe, black stripe on the bottom....I loved them! mine were the simple black lace up ones.... love VANS! LOVE the all red ones!! OMG!!! my first pair were the classic white all white with the padded sides... no blue stripe just all white. my all-time favorite pair though were my black suede chukka boots. I'll never outgrow them... my husband makes fun of me because I still where checkered ones all the time. You're so lucky you got to get those! I have the same purple and white vans they are so cute! I love all your face art and makeup you do! you are naturally gorgeous. Skylar Ng, One of your biggest fans!